Hopewell Valley has a regional Office of Emergency Management (OEM) including Hopewell Township, Hopewell Borough and Pennington Borough. Police Lieutenant William Springer serves as the Executive Director of this regional office. Police Chief Lance Maloney, Fire Chief Matthew Martin, and Public Safety Tech William Mullen serve as the Deputy Directors for Hopewell Township. Both Hopewell Borough and Pennington Borough have Emergency Management Directors as well. The Office of Emergency Management is responsible for planning for, responding to and coordinating efforts during major emergency events in the Valley. The office has developed and constantly updates a comprehensive emergency operations plan. Periodically the office conducts drills involving the police departments, fire departments, emergency medical units, communications centers, health department and other government agencies such as the public works departments. The OEM utilizes an emergency operations center located in the Hopewell Township Police headquarters. This center is activated several times a year for incidents such as floods, major snowstorms, and other large scale events. The Hopewell Valley OEM works closely with the Mercer County and New Jersey State Emergency Management Offices. This secure portal allows residents and businesses to add or update their contact information to ensure they will be included when a message is sent - unlisted numbers, mobile numbers, TDD / TTY requirements can all be entered. Swift911 will supplement other methods currently used to rapidly get important information out to residents such as, cable television notices, and updates to the Hopewell Township website. If you signed up for CodeRed your information has been imported into Swift911. However if you would like to update your information visit the Swift911 portal and re-register your account. 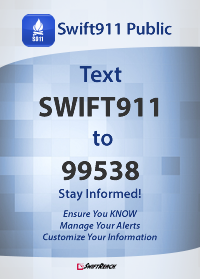 To get the Swift911™ Public App, simply text the word “Swift911” to “99538.” You will receive a response with a link to get the Swift911™ Public App within your app store. This app is free and available on most Apple, Android, and Windows smart phones. You can also register by contacting Hopewell Valley OEM at 1-609-737-3100 ext 5690. We can only alert you of an emergency if we have your correct contact information. So please, help us help our community in keeping everyone informed. The Police Department is also proud to announce that it will be disseminating critical and timely information through Facebook. Friend us at "Hopewell Township NJ Police," like our page and you will receive notifications. This Facebook account is for dissemination of information only; there is no ability to blog or post comments to this page. Visit our Facebook page.